(Sun-News photo by Shari Vialpando) The Las Cruces Sun-News featured Carlitta Harvey as “Artist of the Week” in a July 13, 2009 article by S. Derrickson Moore: Local artist creates Baby Brianna Tribute. 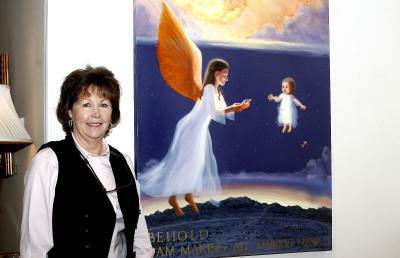 LAS CRUCES — A tiny baby floats above the Mesilla Valley, smiling as she sees the welcoming arms of a beckoning angel in “The Healing of Baby Brianna,” a painting by Carlitta Harvey that’s attracting a lot of attention at The Cutter Gallery. “I worked on it for more than three years. I had this inspiration after I read about Baby Brianna Lopez in the paper and I couldn’t let it go. People really seem to have a strong reaction when they see it. I wanted people to have that as a last impression of her,” said Harvey, who explained that she struggled to “create a new image” of the baby who died in one of the state’s most tragic and notorious abuse cases. “She wanted it to be meaningful for the people of Las Cruces who were so devastated by what happened to Baby Brianna, and she is looking for ways to share it with the public in Las Cruces,” said the artist’s daughter Elizabeth Abrams. “God’s mercy is what the painting is really all about,” said Harvey, a landscape architect who said she began painting “seriously” just a few years ago. Most of the works in the show are love letters to “the people, places and things in the valley that is home to me,” she said. “I grew up on a cotton farm in Fabens, Texas, and frequently spent time in Las Cruces, visiting relatives when I was growing up. I’ve always appreciated the natural landscape of the Rio Grande Valley, including its flora, fauna, agriculture, people, and architecture,” she said.She once planned to major in art, but instead decided to go for “something more practical,” and got a bachelor’s degree in landscape architecture from Texas Tech University. In recent years, she began studying with nationally-known Las Cruces artists Julie Ford Oliver and Carolyn Bunch. “My family has been very supportive ” of her artistic endeavors,” said Harvey. She and her husband, El Paso native E.P. (Phillip) Harvey Jr., have two daughters and a son and are expecting their first grandchild soon. “We ranched in the Tularosa Basin for 11 years, raising registered Hereford cattle, before moving to the Las Cruces area and going into the car wash business,” said Harvey, who still works as a landscape architect but hopes to devote more time to painting. She has worked in watercolor, but said oil is her medium of choice and she enjoys her own variations of plein air painting. “I sit there and look at it and go sketch it,” she said and may work from both sketches and photographs in her studio and return to the site as well. “I like oil because it lasts and you have more time to work with it. It’s more permanent,” she said. Her faith is a crucial part of the creative process, she said. “We are made in the image of God. He made us to enjoy everything he enjoys. I try to capture that in my painting, to glorify God,” she said. Harvey has exhibited her work at the Branigan Cultural Center, the Tombaugh Gallery, and the Las Cruces Convention and Visitors Bureau and the El Paso Art Association show as a sponsored entry by Sierra Medical Center.